In keeping with the post below, I bought Pillsbury pizza dough over the weekend to try a new recipe for breakfast pizzas. 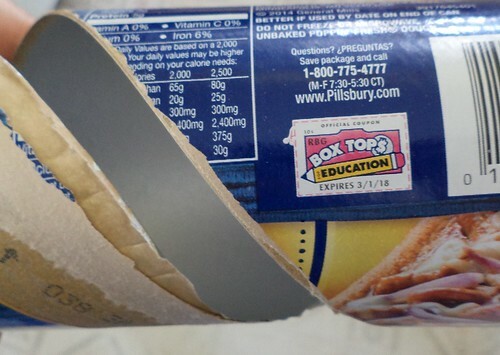 Pillsbury is a sponsor of Box Tops for Education, the long-running program that gets schools a huge variety of items by having kids turn in box tops found on hundreds of items. I usually know someone who has a child collecting them so I save them when I find one on a product I've purchased, like pizza dough. This is vexing, though. I don't know if you've noticed, but Pillsbury canned dough products don't open as cleanly as they used to. It used to be you'd pull the "Open here" tab and most of the label came off as a unit. You could lie the label flat on the counter while you read about making sure your sweet roll edges touch each other or the oven temperature needed to make crescent rolls or, in this case, make a pizza using their dough. I don't know when they changed this but now, when I buy a tube and pull the open here tab, a mere strip comes off around the tube. The redesign probably has something to do with keeping instructions on the container instead of having them accidentally tear into pieces. Seems to me, though, you could print the label to ameliorate that problem. And then, I can't get the label off the container to get at the box top. After several minutes of picking, including a knife which I decided wasn't a good idea, I simply cut around the box top. Frankly, that doesn't seem very sanitary. I'm including the whole tube with this item. Once I got the box top cut away, I tried again and still couldn't get just the label to peel off. So, this is vexing. There has to be a reason they have gone this route, although I don't know what it is. This will be the last year to send my box tops to a certain boy who sent me Flat Stanley last year. Come fall, I'll need to find someone else to benefit from my saving streak. I won't not buy Pillsbury canned baked goods but I won't be cutting bits off the tubes to mail. That's just gross.